The past few years have seen a stream of former SeaWorld employees speak out about their time at the company. Now another employee is stepping forward — and revealing even more details about just how poorly the parks’ animals are treated. “If people knew what I know, or saw what I have seen, they wouldn’t sell another ticket,” she told The Dodo. 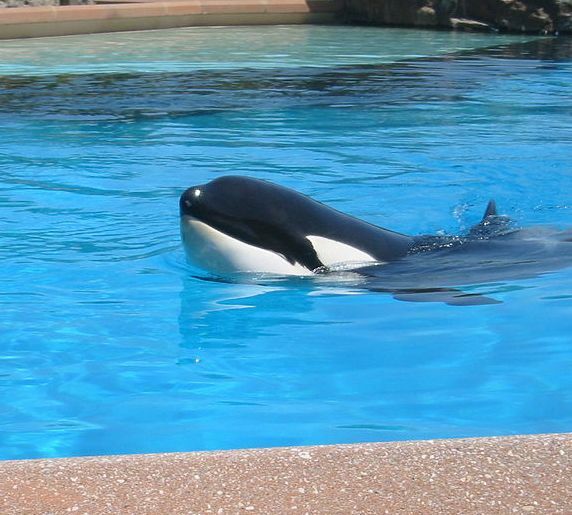 Many of SeaWorld’s animals turn to in-fighting as a result of the cramping and stress of captivity, but Fischbeck said the orcas had it worst of all. This story is horrific. I’m glad the truth is finally beginning to surface. SeaWorld cant deal with their own disgusted ex-employees, let alone PETA. The fact that people still walk through the SeaWorld gates absolutely baffles me. Why on earth any human being with half a brain and a heart of some kind would choose to give money to this heinous corporation in order to watch massive marine animals do circus tricks for dead fish is beyond anything I can comprehend. Being forced to walk through that amusement park filled with animal prisoners looking sick and depressed in their minuscule concrete barren enclosures would be a form of torture for most people. And people make the conscious decision to go there! What the heck is going through their heads?! It is truly hell on earth for the poor captive creatures trapped in SeaWorld’s greedy, selfish and appalling prisons of doom, where each and every animal will die after a lonely, horrible life without family and without any idea of what that animal’s life should entail and WOULD entail if they weren’t locked up in that miserable dump. It’s sad to say, but if SeaWorld refuses to allow their orcas to transition to seaside sanctuaries, the best thing that could happen to them in their life would be a peaceful and painless death. Because orcas and dolphins have no facial expressions, it appears (KEY WORD: APPEARS) as if they are happy and doing fine. Nothing could be further from the truth-would you be happy trapped in a tiny space without family or friends after being separated from your mom at age 4 or 5, only to be dumped into another prison cell full of unknown, unkind strangers who are all of similar mind, depressed and angry and suffering? If they COULD show facial expression, they would all have looks of desperation, sadness, and terror. No one would ever want to see animals looking the way they would if they could actually show their feelings on their face like humans can. Unfortunately for these poor creatures, it appears as if they’re smiling even though they are doing anything but smiling. That attribute, and their absolute lack of aggression towards man, has been their downfall.